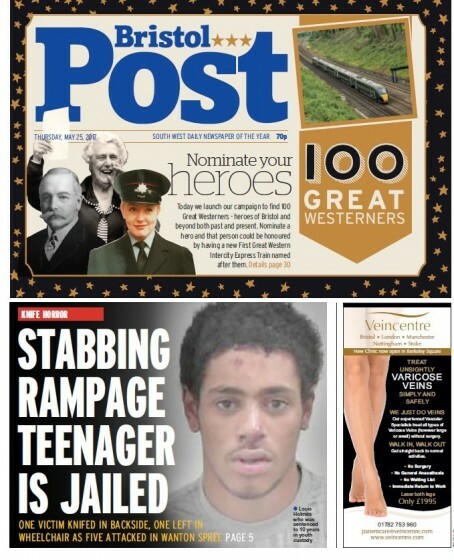 Ten newspapers have come together in a campaign to help find the 100 greatest people from their regions. Trinity Mirror West has launched its ‘100 Great Westerners’ campaign, which aims to celebrate the most inspiring individuals from the South-West of England and South Wales. Readers can nominate figures from the past or present and those who poll top will have a locomotive named in their honour by Great Western Railway, which is supporting the campaign. The newspapers taking part are the Bristol Post, Bath Chronicle, Exeter Express and Echo, Gloucestershire Echo, Gloucester Citizen, Western Daily Press, Western Morning News, Plymouth Herald, South Wales Echo and South Wales Evening Post. Mike Norton, Bristol Post editor and Trinity South West’s deputy managing director, said: “The 100 Great Westerners is an exciting way for us to celebrate some of the most inspiring individuals from the South West region and South Wales. “We’ve joined forces with Great Western Railway to celebrate the 100 greatest Westerners of all time, with the top nominations getting a new GWR locomotive named in their honour. GWR is making a once in a generation investment into these incredible new trains, and it’s exciting for us to be able to play a role in helping them find suitable names for the new engines. “Our region is filled with inspiring individuals, from leading lights in business to great engineering minds, from charity leaders to digital path finders, and over the next few weeks titles across Trinity Mirror West will highlight their own reader nominations. They can be past or present, adopted residents or born and bred locals, but we want to find the greatest local heroes from the fields of sport, charity, community, business, arts, entertainment and academia.